The inaugural meeting of key individuals supporting the formation of a statewide breastfeeding coalition was held on April 11, 2008 in Maitland. The attendees from around the state included physicians from three teaching hospitals/state universities, International Board Certified Lactation Consultants, Registered Dietitians, WIC Breastfeeding Coordinators and Registered Nurses. 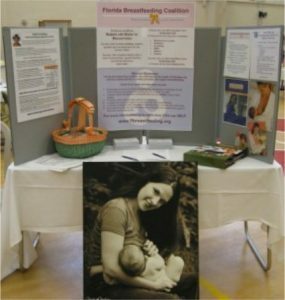 As a statewide coalition, the Florida Breastfeeding Coalition is registered with the Centers for Disease Control and Prevention (CDC) and the United States Breastfeeding Committee (USBC) which allows the Coalition to participate in national training seminars and meetings to assist our state in legislative advocacy, minimizing barriers to breastfeeding, and supporting breastfeeding for healthy mothers and babies/children. The CDC is tracking state breastfeeding rates and promotion activities and has encouraged the formation of statewide coalitions. The CDC reports information about coalitions and coalition websites in the CDC Breastfeeding Report Card. The United States Breastfeeding Committee has also been involved in the interface with the state breastfeeding coalitions. The Florida Breastfeeding Coalition received their official determination letter for 501(c)3 on April 17, 2009. To learn more information about the history of our coalition please feel free to browse our archives link.